Orion Radio 5810 08:41 33333 AM Forum website advert. Dutch music. Mystery Radio 6220 08:39 45444 Pop music. Radio Paardenkracht 6310 09:39 44444 “Rock and Roll Part 1” (Gary Glitter). 34333 at 10:30. “I Love Rock ‘n’ Roll” (Joan Jett & the Blackhearts) at 10:44. UNID 6313 08:44 23332 Polka. Delta Radio 6220 11:08 24332 “Whatever You Want” (Status Quo). ID jingle played many times. UNID 1640 11:29 45444 Talk, dutch music and then off. 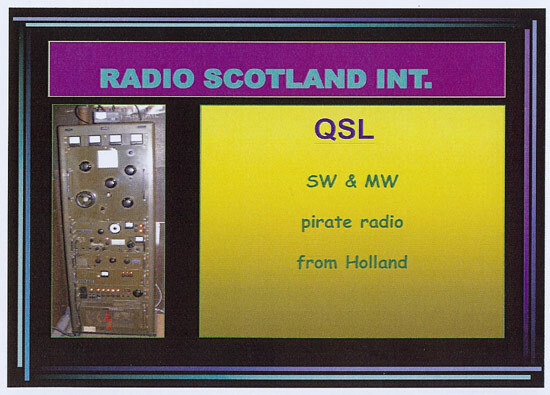 Unusual to hear a Dutch MW pirate with such a strong signal at this time. Relmus Radio 1662 17:00 44333 “I Just Died In Your Arms Tonight” (Cutting Crew). Skyline Radio International (tent) 3910 8:45 33333 Dutch music. Radio Scotland International 5791 8:56 55444 Music. Off at 8:57. Shortwave Cowboys 5800 8:58 33333 “Eye of the Tiger” (Survivor) at 9:25. Later 23222. Radio Borderhunter 6210 9:01 55444 “London Calling” (The Clash) at 9:09. “Go Your Own Way” (Fleetwood Mac) at 10:07. Mystery Radio 6220 8:39 33333 Music. Radio Brandaris 6305 11:31 45444 “Ghostbusters” (Ray Parker Jr). ‘Low power’. UNID 6307 12:14 14221 Canned laughter. Radio Waves International 6325 9:04 23332 Country music. Still there at 12:35. Radio Orban 1640 20:45 45333 “The Day Before You Came” (Abba) at 21:03. Radio Altrex 6285 9:14 34333 “Wuthering Heights” (Kate Bush). At 10:46, “Paranoid” (Black Sabbath) – SINPO 34232. Radio Alice 6309 15:37 44433 Testing a new antenna. “Baggy Trousers” (Madness) at 15:47. Playback International 6870 10:36 22332 Usual ID jingle, jazz. Persistent utility interference. Bogusman 3932 12:19 45444 Same programme as yesterday. Better reception. UNID 6265 9:17 44333 Soon started to fade out. “My Girl” (Madness). Radio Brandaris 6305 11:01 45333 Experimental transmission. Mostly instrumental music. Bogusman 3932 15:30 44333 Talk about the credit crunch. Usual eclectic mix of music. Radio Scotland 5791 10:09 45444 Closing down, “Two Can Play That Game”. Misti Radio 6210 10:23 14231 Heard ID and email address through the noise. UNID 6215 9:19 24232 Oldies. Radio Altrex 6260 9:12 33333 “Firestarter” (Prodigy). 20 watts. Many thanks to all the stations above. WNKR 1476 20:57 14321 DJ with London accent, music. Orion Radio 5815 9:33 35323 Dutch pop. Off at 10:39. 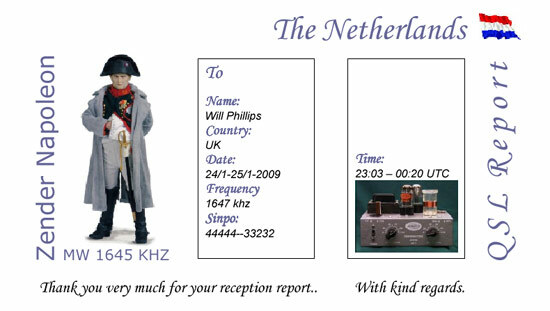 Geronimo Shortwave 5830 11:00 34333 British DX Club advert. “Burning Heart” (Survivor). Initially fair reception, but had faded out 15 minutes later. Misti Radio (tent) 6210 11:09 24131 Just audible under the noise.